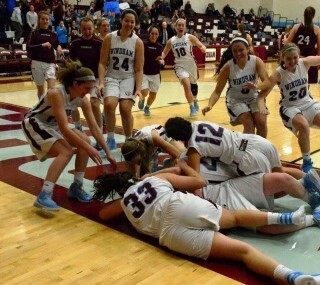 Windham resident and University of New England freshman Sadie Nelson was recently named the Common Coast Conference Basketball rookie of the week for the third time in as many weeks. She was also chosen as the Maine Women's Basketball Coaches Association (MWBCA) Rookie of the Week. For the week ending December 4,th 18-year-old, 5’10” (on paper) Nelson averaged 16.7 points, 4 rebounds, 2.7 assists, and 3 steals per game in a 2-1 week for UNE. 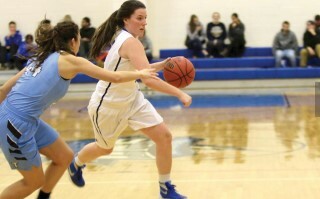 Nelson scored a career high 27 points in a win over Salve Regina. She shot 51.3 percent from the floor for the week. This is not surprising as Nelson is no stranger to excelling on the basketball court and appears to be picking up where she left off during her years at Windham High School where she reached a challenging and important milestone of scoring over 1,000 points. She also participated in soccer and softball while attending WHS where she was McDonald’s all-star and first team all-conference performer in basketball. 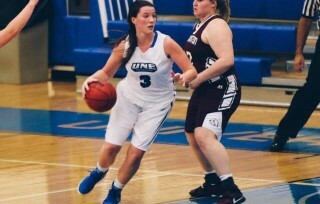 “Sadie is off to a great start at UNE playing on the women’s basketball team. I’m not surprised she is contributing as soon as she has. All the tools to compete at the collegiate level are in her possession,” said Windham High School athletic director Rich Drummond. But this just explains her skill set on a physical level. It takes more than that to make a great player. “In looking at what makes Sadie a great player I would have to say her attitude is first and foremost. 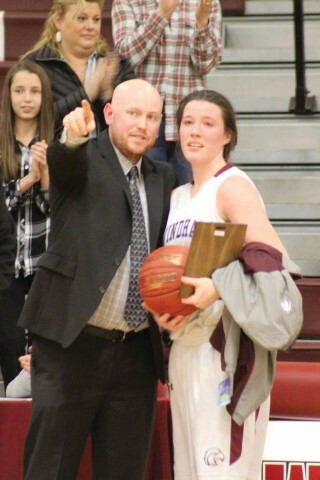 During her years at WHS she was very coachable and brought a positive attitude to the teams she participated on. She is truly blessed with basketball talent and that was obtained through countless hours of work and dedication,” continued Drummond. Clearly her attitude has been her biggest asset having devoted countless hours over the years improving her game through the support of her coaches, teammates and family, added Drummond. However, Nelson’s contributions are not limited to the court. “It also needs to be mentioned that along with all of the hours she has devoted to her game, she has put in just as much time giving back to her community. During her four years as a varsity player she was seen countless times working with future Windham Lady Eagles Basketball team, improving their skills as players during the season and in the summer. UNE has obtained a great player, but a better person to represent their school on and off the court,” concluded Drummond. There also can be pressure to be good. “When I was younger I did feel some. When I was a freshman in high school I didn’t have a lot of confidence compared to now. I probably put more pressure on myself then, but I definitely learned to move away from that. Now I feel like I am on a team with players that are more experienced and it’s not as hard. I’m not the focus anymore. There are a lot of players around me that are really, really good, like player of the year,” she said. Nelson does her best to stay in touch with former coaches and teammates. “Coach Artes came out to see my first game. That meant a lot. I haven’t seen one of their games yet but I’m on break so I will try to get to as many games as I can. I still stay in touch with WHS players. I still miss playing here but I’m glad I can come back and look at it.” With plans of living at home the next couple of years she will have more opportunity.